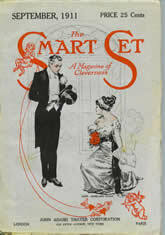 The first issue of The Smart Set magazine was published March 10, 1900, with the subtitle, “A Magazine of Cleverness.” It was the ultimate in sophistication and chic, edited by H. L. Mencken and George Jean Nathan. Some of the best-known writers of the time could be found in the magazine. The Smart Set is credited with discovering F. Scott Fitzgerald, O. Henry, Eugene O’Neill, and Edna St. Vincent Millay. Will’s first bylined piece in the magazine was published when he was nineteen, but his epigrams had already been appearing for two years. He was only seventeen when he received a letter from Mencken saying, "You seem to know precisely the sort of epigrams The Smart Set needs, and we shall be very glad to have you submit them regularly.” He did so. Each sale brought him $5, and Will was on his way. 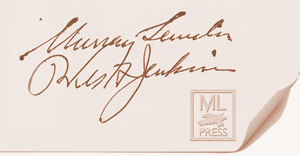 At times, Mencken had trouble filling The Smart Set magazine and solved his problem by encouraging both his well-known authors and the new young writers he was fostering to adopt a variety of pen names. Thus “Murray Leinster” was born. Soon, Will began appearing in The Smart Set as both William F. Jenkins and Murray Leinster (pronounced Len'-ster). The name was derived from Will’s mother’s maiden name “Murry” and indirectly from his middle name, “Fitzgerald.” Wyndham Martyn, an English writer and friend later known for the Anthony Trent novels, told him that the Fitzgeralds in Ireland were descended from the Dukes of Leinster, so he adopted the name. Did Will Jenkins invent anything that he saw work in his lifetime? His constant experimenting resulted in an invention, named "front projection." For this he holds patent #2727427, issued on December 20, 1955 for an "Apparatus for Production of Light Effects in Composite Photography" and patent 2727429, issued the same day for an "Apparatus for Production of Composite Photographic Effects."
. . . Will began appearing in The Smart Set as both William F. Jenkins and Murray Leinster (pronounced Len'-ster). The name was derived from Will’s mother’s maiden name “Murry” and indirectly from his middle name, “Fitzgerald.